Colorado Shakespeare Festival Magazine helps patrons understand the history and educational mission of the festival, which celebrates its 61st anniversary in 2018. The magazine also provides informative articles about each production. 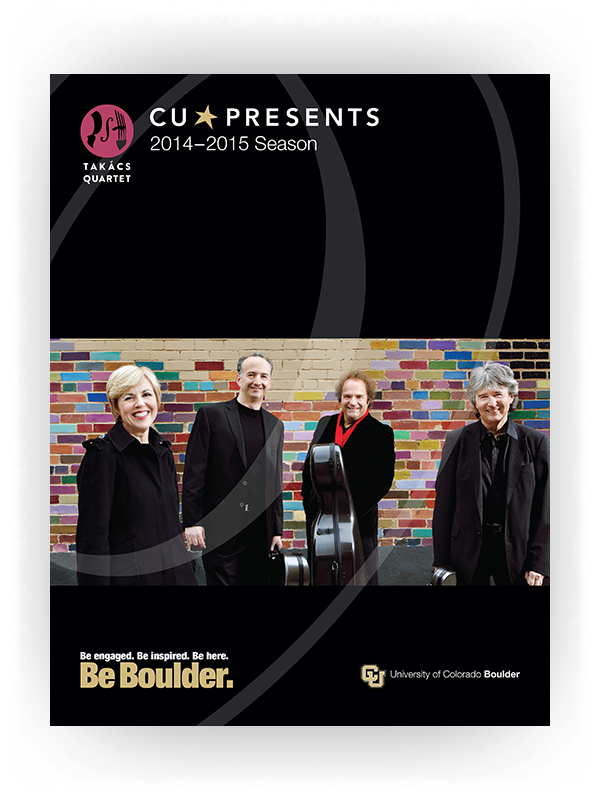 The Festival features a professional theatre company that works with the University of Colorado Boulder. The Festival celebrates Shakespeare and his influence and vitality through exciting, high-quality productions. Epic love stories, family dramas and laugh-out-loud amusement are part of the offerings for the 2018 season. And, for the first time in a while, the lineup features two non-Bard productions. Plays are performed beneath summer night skies in the historic Mary Rippon Outdoor Theatre and in the recently renovated indoor University Theatre. The Theatre has hosted plays since 1944, when Romeo and Juliet was staged. The stage, lighting and acoustics have been upgraded numerous times since. The University Theatre is a traditional indoor proscenium stage with balcony seating located in the central part of the picturesque CU campus. From left: Blake Williams, Elise Collins, Cindy Spitko, Austin Terrell (Tragedians), Kristofer Buxton (Alfred) and Sam Gregory (The Player) in Rosencrantz and Guildenstern are Dead. The Bard’s most murderous, malicious and mesmerizing king comes to the CSF indoor stage for the first time. Richard, Edward IV’s deformed and embittered younger brother, will do anything to take the crown for himself—but once he has the throne, everything falls apart. The inspiration behind the hit film Roxanne, Edmond Rostand’s timeless romantic comedy has it all: passion, panache and thrilling swordplay. Cyrano, witty and proud but crippled by insecurity, secretly pines for Roxanne—but she has her eyes on handsome, empty-headed Christian. When Alice brings her boyfriend’s traditional, straight-laced family to dine with her household of freethinking eccentrics, fights break out and fireworks erupt. Kaufman and Hart’s 1930s classic, more relevant today than ever, pays homage to those who march to the beat of their own drum and reminds us all to choose dreams over drudgery. England’s king is out to capture the crown of France and the heart of a married countess. The cost of his lust? Personal humiliation and 150 years of English battle and bloodshed. This unique, one-night-only performance, inspired by the stage practices of Shakespeare’s own time, is summer’s hottest ticket. Programming is subject to change and shows can be added, postponed or canceled. The Publishing House has complete design and production facilities available. Ad design is complimentary with purchase. We prefer advertising be submitted in PDF format. PDFs must be high resolution, CMYK format with fonts converted to outline or embedded. (Pantone colors and spot colors should be converted to CMYK.) 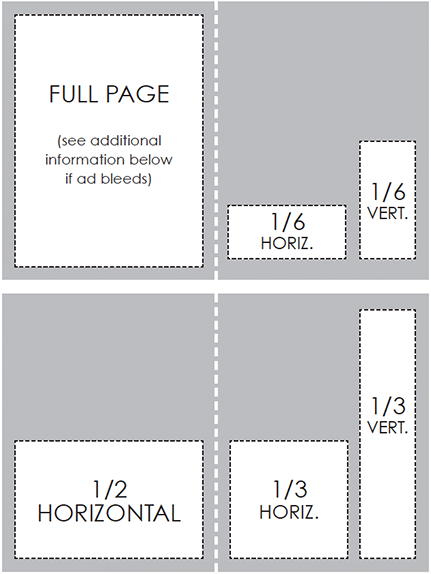 If a PDF requires any editing, a new file will need to be provided by the advertiser. We cannot guarantee the quality of JPEGs, GIFs or PDFs that are provided to us that are not high resolution. If supplying a TIFF or EPS, they must be CMYK and at least 300 dpi and fonts must be converted to outline or embedded. Positioning of advertisements is at the discretion of the publisher unless guaranteed premium position is contracted. Send to your sales representative or sales@pub-house.com.